Bezuidenhoutfonds brings Guy Livingston and Charlie Dee to Earth Day Bezuidenhout! We are pleased to announce that Bezuidenhoutfonds has decided to help sponsor our event, along with the Stichting Christus Triumfatorkerk, who has generously allowed us to use their meeting room and event center for the location of Earth Day 2015! What does this mean? We will be able to provide top quality musical performances by both Guy Livingston and Charlie Dee. the world, including performances as a soloist with the Chicago Symphony, recitalist at the Centre Pompidou, The Louvre and the Moscow Conservatory among other locations. He has received significant press in both The New York Times and National Public Radio and he has recorded for Transatlantic, New World, Wergo and Mode Records. 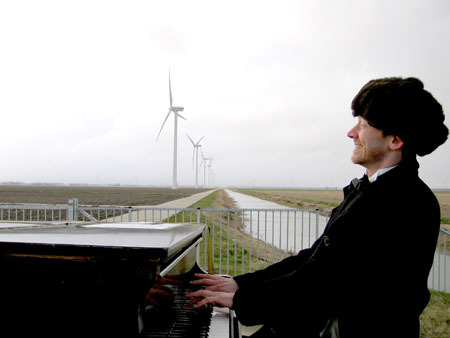 He will give a 25 minute recital at the Earth Day Festival, with a selection of music from Gershwin and Debussy that explores the theme of water. If you miss his Earth Day performance on Saturday, April 18th, you will have one more chance: Guy Livingston will be doing a benefit concert on Thursday, July 2nd, 2015 at 20:00 in the Christus Triumfatorokerk. All proceeds will go to the repair of the Christus Triumfatorkerk church organ. Learn more about Guy Livingston’s notable career and current events here. Mr. Livingston is currently residing in The Hague. We are also honored to have critically acclaimed Dutch singer-songwriter Charlie Dee performing at the Earth Day event. More information to follow!